Violet can sense the echoes of those who've been murdered—and the matching imprint that clings to their killers. Only those closest to her know what she is capable of, but when she discovers the body of a young boy she also draws the attention of the FBI, threatening her entire way of life. As Violet works to keep her morbid ability a secret, she unwittingly becomes the object of a dangerous obsession. Normally she'd turn to her best friend, Jay, except now that they are officially a couple, the rules of their relationship seem to have changed. And with Jay spending more and more time with his new friend Mike, Violet is left with too much time on her hands as she wonders where things went wrong. But when she fills the void by digging into Mike's tragic family history, she stumbles upon a dark truth that could put everyone in danger. 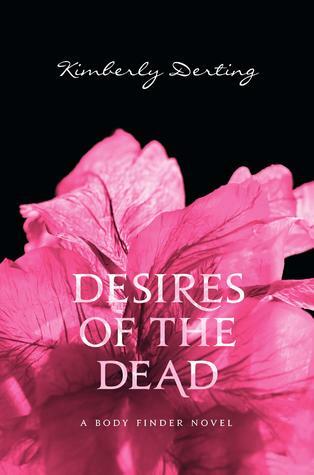 Desires of the Dead is set three months after The Body Finder. There’s a new guy at school called Mike, there’s also a stalker following Violet around because they fancy Jay. The FBI is now interested in Violet and her ability, and, of course, there are dead bodies. Violet hears an echo coming from a shipping container in the shipyard. She can’t get in there, so she leaves an anonymous call with the police, saying that she heard someone. She tells Jay what happened and he insists that she tells him next time she does something like that. The other POV seems to be from someone who loves/is obsessed with Jay. Vi starts getting jealous of Mike, the new guy, because he’s taking up her Jay time. Sara Priest from the FBI wants to ask Violet some questions about her ability and the boy that was at the shipyard. Vi refuses to Sara gives her her card. The stalker person leaves a dead cat in Violet’s drive. Gross. The stalker witnesses Violet bury the cat. A guy called Rafe (*swoons*) finds Violet when she’s on a date with Jay, and gives her a message from Sara Priest. He reminds Violet to call Sara, or him if she finds that more comfortable. Meanwhile, on the date, Mike and Chelsea get together. Violet meets with Sara Priest. Sara asks about Mike, because she recognised him from an old case from two years ago when Mike’s mother went missing. Sara tells Violet that she works with people who have special abilities. She asks Violet to take a look at some people in a police line up and tell her if any of them have a connection to the boy from the shipyard’s murder. She couldn’t hear the correct imprint, meaning that the murderer wasn’t there. It turns out that the men from the line up were all FBI agents. Violet feels an imprint on one of her classmates. Stalker Person leaves Violet a creepy note about the dead cat, and then later on calls her phone. Violet goes to Mike’s house and the person who killed the cat is in there. She feels the imprint and runs. She tells Jay that she thinks that the Stalker Person is Mike’s sister, Megan, but Jay doesn’t believe her and they fall out over it. Stalker Person calls Violet again, and this time Violet says that she knows it’s Megan and she knows what she did. Stalker Person hangs up. Violet calls Rafe and they meet up. He wishes her a happy birthday. Violet goes home and has a small birthday party with her family, although she would prefer time to herself. Violet sees Megan at school but she doesn’t see the imprint. She feels terrible because she fought with Jay over this. Violet and Jay make up. Violet goes to see Rafe and Sara. She tells them about the Stalker Person. Sara asks Violet if she has any idea who it might be, and Violet suggests Lissie Adams since it wasn’t Megan. Mike invites Jay and Violet to his dad’s cabin in the woods. It turns out that Stalker Person IS Megan. She’s lonely and is jealous of Violet for having so many friends, and a hot boyfriend. She’s also very disturbed because her dad is a drunk. Violet decides that she wants to help investigate the disappearance of Mike and Megan’s mother. She goes to investigate a guy called Roger Hartman, and finds a dead dog buried in his garden. Rafe finds her and calls Sara. It turns out that the dog has had its neck broken – not a natural cause of death. Mike, Megan, Jay, Violet, Chelsea, and Claire go up to the cabin in the woods. Violet senses a body in the woods. She can’t dig it up straight away because everyone would see her. That night, Violet sees the imprint for the body on Ed Russo – Mike and Megan’s father. Knowing she can’t accuse him without a body (what if it’s a deer? ), she goes to dig the body up. Megan follows her. Ed sees Violet digging up the body. He reveals that he killed his wife because she was going to leave him for Roger Hartman, and she wanted to take Mike and Megan with her. Megan overhears. Mike sees them, and Megan tells him what their father did. Jay has to stop Mike from killing Ed. Ed breaks down. The cops are called. Sara tells Violet about how Ed had been harassing Roger Hartman for months. Ed is taken away. Violet identifies the guy who killed the boy from the shipyard for Sara. Echo – What Violet senses on dead bodies. It can be related to either taste, scent, sight, or sound. Imprint – What Violet senses on people who have killed animals or people.